I rarely miss the chance to take a workshop from instructor, Steve Pittelkow when he is in town teaching at Asheville BookWorks. He is an amazing marbler and wonderful teacher. I especially recommend his multi-day classes where you spend a day or two creating papers and then another day building a box or book using those papers. 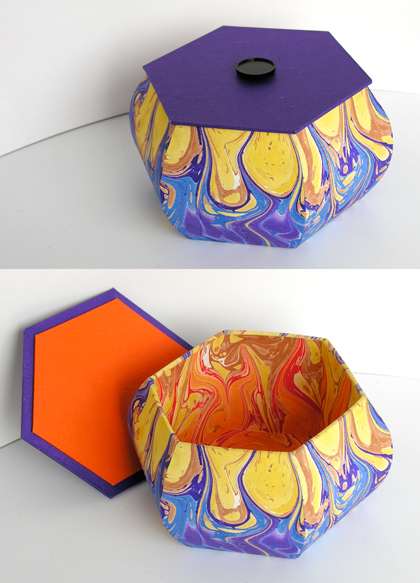 The Lantern Box project was the first project where I designed a sheet of marbled paper specifically for the box. I wanted the inside and outside of the box to be covered using one piece of paper which would flow together, but have distinctly different colors. I used a freehand technique to pull the marbling ink into the flowing shapes I desired vs. using a combing technique to make a specific pattern. The box itself was an interesting one to make. It is a double walled hexagon shape with curved exterior walls and straight interior ones. It is actually not as crazy hard as it looks, but like all boxes I’ve made cutting carefully and patience in the assembly is needed. The end result is colorful and remarkably sturdy.